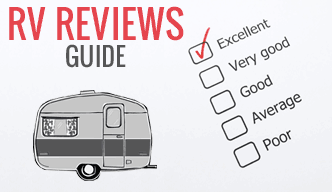 We’ve all heard of “open source” software and computing projects, but what about an open source RV design? Yeah, it’s a first for us too! The EcoRoamer is our number one pick for the best vehicle to survive the zombie apocalypse, and after you see some of its features, you’ll understand why. The one caveat made when asking for nominees for the list was that you could find some way to fuel it, and you might need a second mortgage to fuel this bad boy even sans zombie attack. 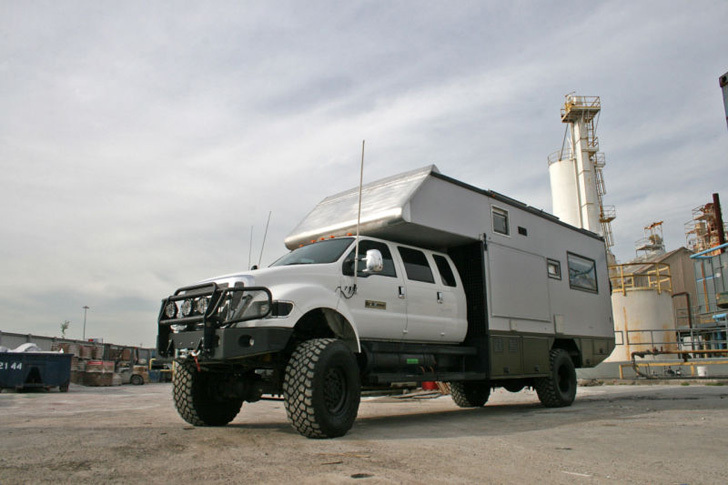 The EcoRoamer is based on a Ford F650 – that’s a big truck to begin with! It’s mean and tough, but still has room for a baby’s carseat in the back. 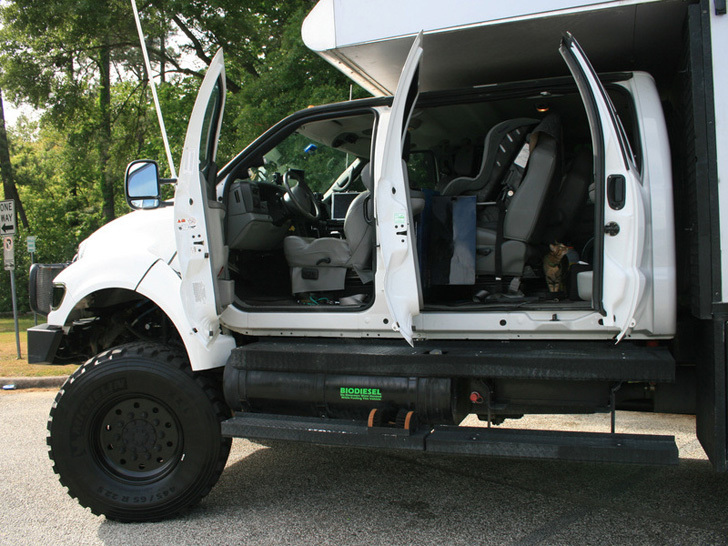 First, it’s built on the totally bad-to-the-bone Ford F650 platform. This is one heck of a big truck. 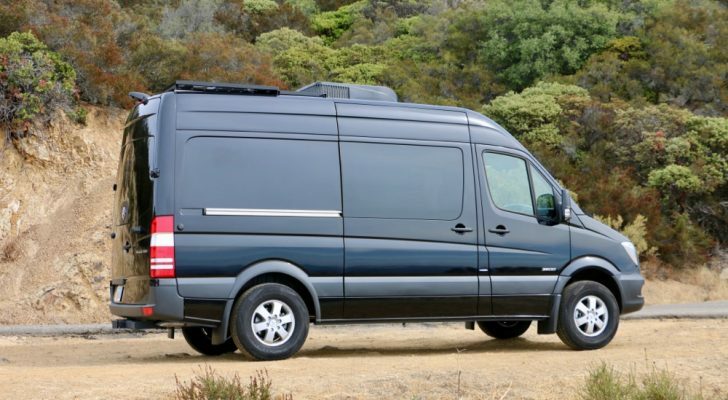 Among its more “esoteric” features, the EcoRoamer boasts 46 inch tires, a diesel engine commonly reserved for construction equipment and a WiFi system that can spread a “hotspot” a mile in diameter! Pretty cool, right? We thought so too. 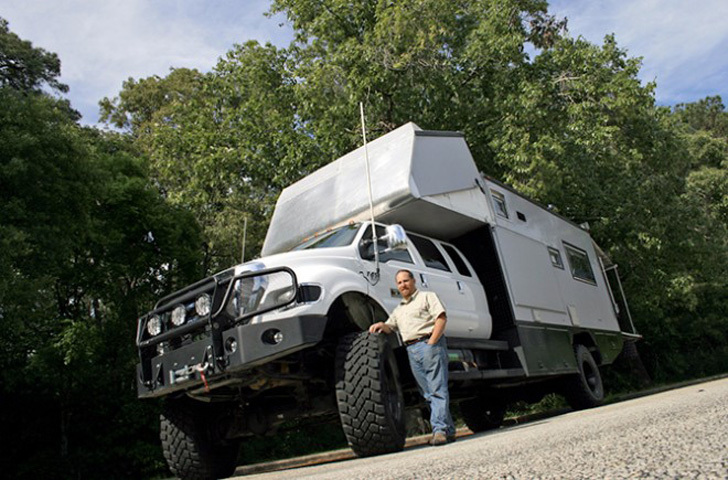 Jay Shapiro stands beside 46 inch tires showcasing the huge scale of his EcoRoamer. 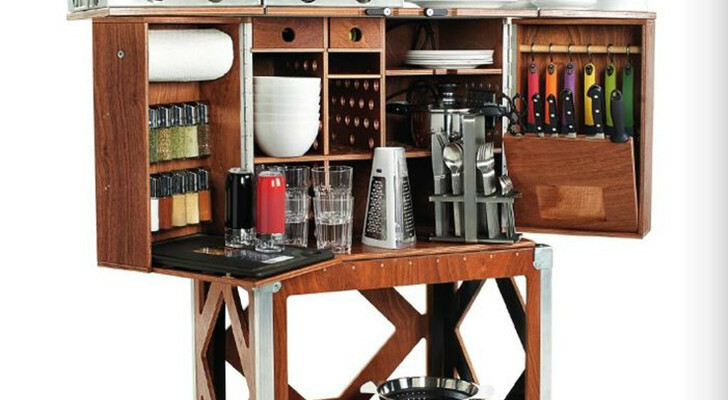 Designer Jay Shapiro built the original EcoRoamer as his family home. Shapiro, wife, two kids, and miscellaneous pets are headed from Alaska to the tip of South America, across the ocean to Africa, up across the Bering Strait, through Europe, and ultimately destined for Mongolia! 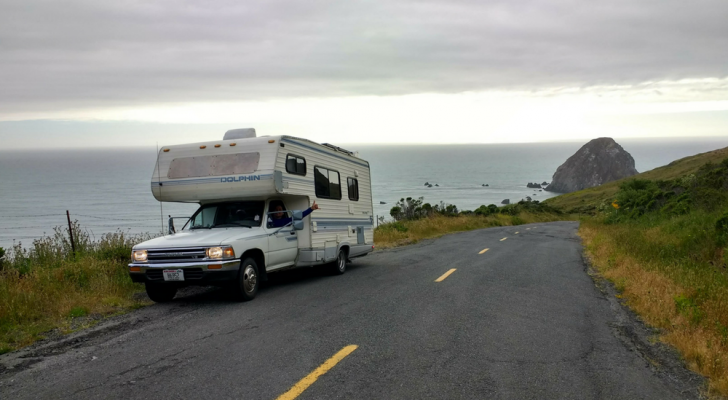 How’s that for a family road trip? Now, before you go off about this rich jerk ruining the planet, hang on a sec. The EcoRoamer only looks wasteful. Most of it is built from recycled material, powered by solar, and driven on clean bio-diesel. The goal? To travel the planet without leaving a wake of damage behind them. The screened sleeping porch folds out from the rear. The behemoth F650 is powered by a Caterpillar C7 diesel powerplant, and since the biodiesel Shapiro uses is not overly common, the truck stores up to 130 gallons of its own fuel, meaning it can run up to 750 miles between fueling. The engine will also run on standard diesel in a pinch. The truck weighs over 17 tons and requires every bit of the 350 horses from its motor to traverse the rugged terrain. 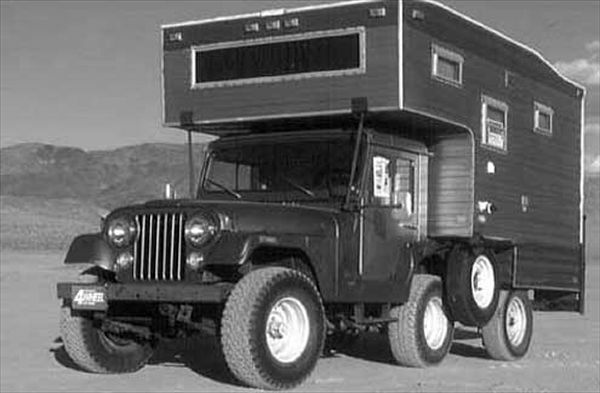 Since 650s are not designed for off-road, it had to be fitted with a special 7 ton axle to add the 4×4 capability. The EcoRoamer’s tough book, driven by Windows. 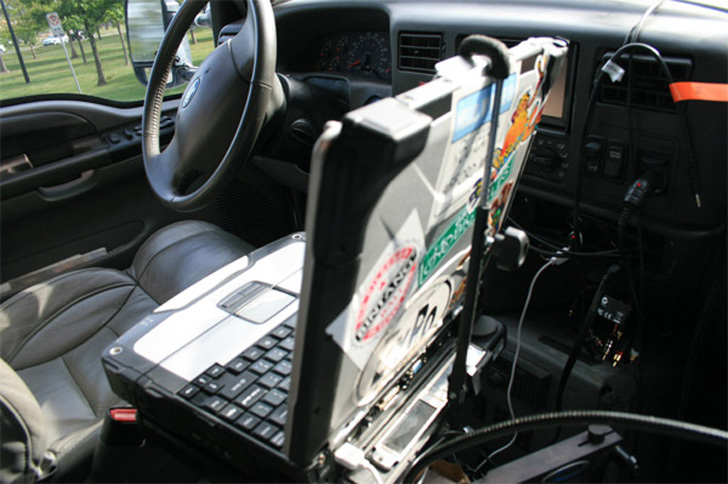 The high tech cabin is driven by a Windows OS Toughbook and the amazing WiFi system can generate 3GS for up to eight tenths of a mile and adapts to satellite hookup when that isn’t available. 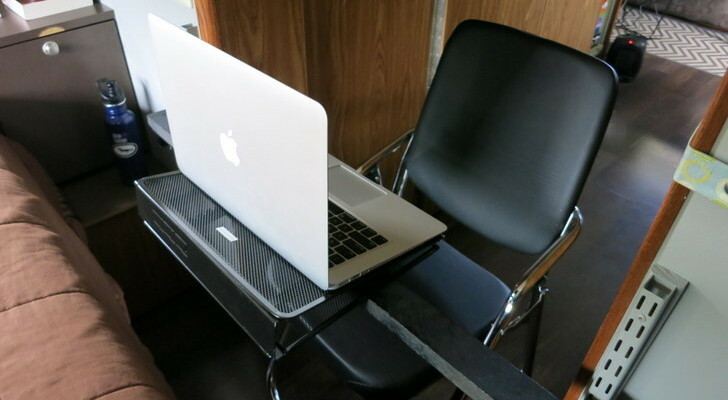 The kids each have their own airline-style foldable desks, with head rest DVD players. Interior design was paramount for the family of four and based on three main objectives: comfort, storage, and reliability. To achieve that, they went with a modern loft feel, with many surfaces covered in a renewable “PlyBoo” bamboo plywood material that is strong, lightweight, and durable. 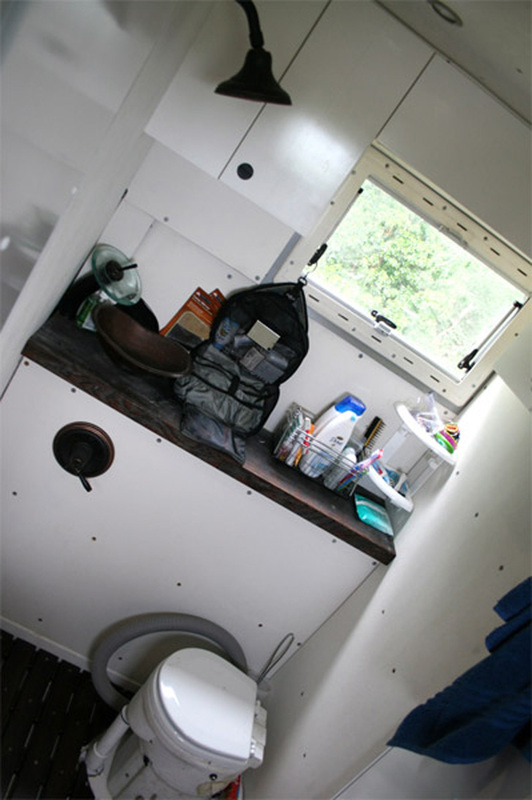 EcoRoamer’s bathroom with shower and composting toilet. 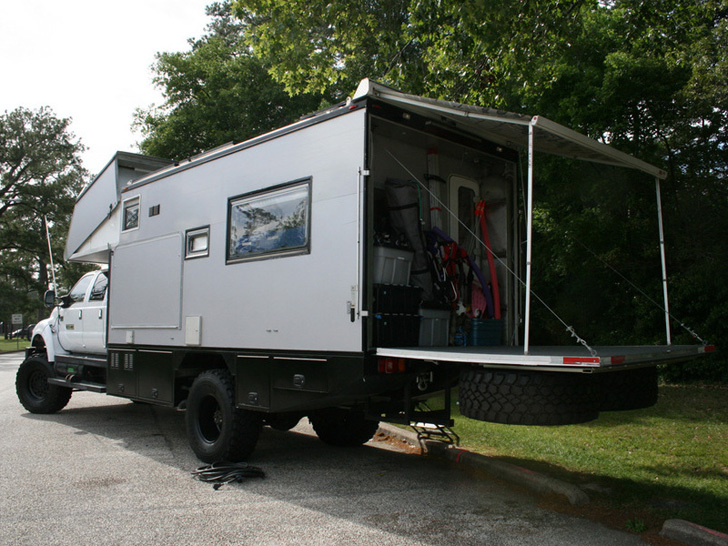 The truck can sleep eight, with a loft over the cab and a popup roof for the kids. 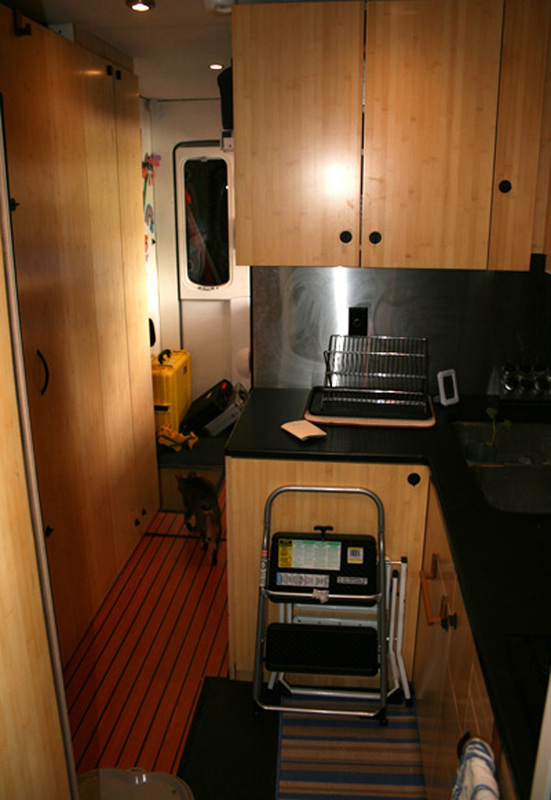 There’s also two foldout sleeping areas, including a screened in back porch that unfolds and a driver’s side wall panel that folds out to create a full sized air mattress-sized shelf. Amenities include a shower and composting toilet that actually drains onto the exhaust, causing the liquid waste to turn to steam vapor. The kitchen is dorm style with a two burner stove, convection oven and washer/dryer combo that is considered a “luxury” item. 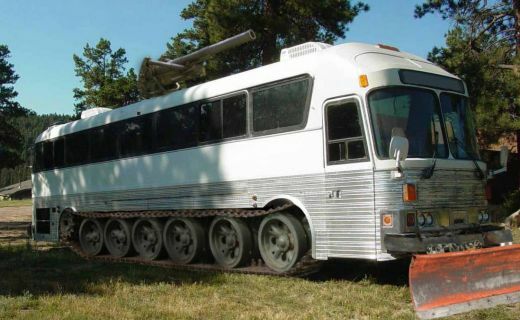 All in all, this bad boy is basically ready for anything and it looks like a pretty cozy place to weather nearly any “jello hits the fan” scenario you can think of, except maybe global flooding, since the 17 ton truck is unlikely to float well without a cargo ship underneath it! So, if you’d like to build your own, Shapiro is willing to lend his plans, but it’s going to cost you, starting at $275,000, enough to buy a very nice house in many locales. For more information, visit their website at EcoRoamer.com.